My three children love music and so I have included a music appreciation class in our homeschool each year. Over the past few weeks we have been enjoying dancing and singing to four different children’s music CDs featuring talented musical artists. Get Moving with Ella Jenkins is a Smithsonian Folkway CD that is a favorite with my children. In fact, they always ask for it during our music class. It is no wonder that Ella Jenkins has been crowned, “The First Lady of the Children’s Folk Song” because she has been performing children’s music for over 50 years and she is so talented. Get Moving with Ella Jenkins is the first cd that we have listened to by this artist but it won’t be the last….my kids were giggling, singing along and dancing to all of the 15 popular songs featured on this cd. The artist gives the children easy to follow instructions throughout each song inspiring them to hop, skip, clap, jump and more. There are child favorites like Teddy Bear, Follow the Leader and One Potato, Two Potato along with songs that we enjoyed but were less familiar with such as Play Your Instruments, Did You Feed My Cow? and their favorite, Who Fed the Chickens?. 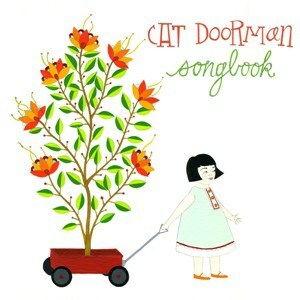 The Cat Doorman Songbook ($14) featuring musician Cat Doorman is a 14 song tribute to the wonders of childhood. The lovely melodies of Cat Doorman are backed by real instruments performed by a variety of talented musicians and the creative songs include Effervescing Elephant, Let’s Get Dressed Up, Little Red Wagon and Whistling Song. I really love that this CD includes a beautiful songbook within it making it a great gift idea that is sure to be played over and over. I often play this CD when the children are playing quietly and I have noticed as they learn the lyrics they sing softly along as they are playing. The Not-Its! Kidquake! ($12) album is available as a CD and on iTunes featuring fun yet powerful songs that were performed to inspire kids to do good for others. 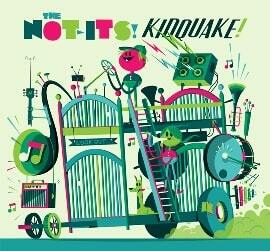 Songs include our favorite, Tarantula Funeral, Walk or Ride, Temper Tantrum, Let’s Skateboard and the title song Kidquake! The Not-Its! are a band of artists that feature positive songs, a funky beat and instruments that really appealed to my seven year old son. I appreciate that it is easy on the grown up ears too…love that it is smart, entertaining music that I can enjoy listening too as well. It’s Not Fair to Me ($13.99) by two time Grammy Award winner, Bill Harley and Keith Munslow is best described as silly, wacky fun about childhood angst that my kid’s love with songs about ugly sweaters and one my oldest son claims he can appreciate about complaining, whiny little brothers. Their favorite “anthem” is the song titled, Stinkeye which all three of my kids have decided is the funniest song every written as they go around giving everyone they can think of their own version of the “Stinkeye” causing fits of uncontrollable giggling. It is amazing to experience the musical talent of these children’s artists who I admit that I had never heard of before….I love that I can help my children develop a passion for music that expands beyond the mass market children’s music titles. All of these children’s music albums are exceptional in its own unique way and is a great way to get children up and dancing and singing…best of all it gets out their energy which is great for Mom too! I have been eyeing the KidQuake! CD since it’s recent release. I know my boys will love it, and I love that we can all listen to it without my ears bleeding. YEAH for adult appropriate kid rock! I like the cat doorman cd. I am not familiar with the others, but Ella Jenkins is wonderful. I recently enjoyed listening to her (6 minute) interview on NPR http://www.npr.org/2011/02/28/134130732/ella-jenkins-still-making-friends. i have heard great things about Cat Doorman, and would LOVE to hear the album with my daughter! My mom is a teacher and she loves using Ella Jenkins music with her students. That CD would be perfect for her to utilize in the classroom. my little one would probably like The Not-Its! Kidquake! most. thanks! I think the favorite would be Get Moving with Ella Jenkins. They all sound like fun. Get Moving with Ella Jenkins – my son loves to move around with music! I think that they will like It’s Not Fair To Me best. I think my kids would love The Not-Its! Kidquake! It’s Not Fair to Me! the It’s Not Fair to Me! I think my daughter would like “Get Moving!” the best. Thanks for hosting! The cat doorman’s song book seems very interesting.